Plato was an ancient Greek philosopher who is credited with laying the foundations for Western philosophy, alongside his teacher, Socrates, and his student, Aristotle. One of his most famous writings is the Republic, a series of dialogues that feature Socrates discussing many topics of philosophical interest with others. He also founded the Academy in 387 BC, which spread his teachings for centuries after his death. In Mario's Time Machine, Mario meets Plato after he travels back in time to return a copy of the Republic to him after Bowser steals it from ancient Athens. According to Mario's Time Machine, Plato was teaching at the Academy in 369 BC. 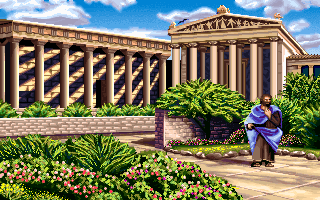 The conversation between Mario and Plato is different between the SNES and PC released: in the SNES version, Mario attempts to ask Plato about the book in his possession, but Plato dismisses him and instead continues contemplating how to conduct one's life. In the PC version, Mario asks him if the book in his possession belongs to Plato, but Plato in turn asks Mario whether a book can be owned by its author before dismissing him and returning to his contemplation. To absolutely confirm that the book belongs to him, Mario must talk to some of Athens' citizens, which includes Aristotle. After Mario has explored enough, he can finally return to Plato and give back his book. Plato is excited to have his book back, but he also says that the knowledge within the book is meant for all. Plato encourages Mario to continue asking questions because every question is worth the time it takes to answer it. 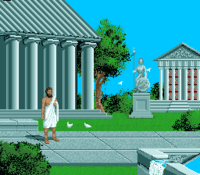 Plato's in-game appearance in the PC release of Mario's Time Machine is based on The School of Athens, a painting by famed artist Raphael Sanzio that depicts notable figures of ancient Greece and features Plato and Aristotle at its center.